The campus at Fairfax officially opened on Monday, September 14 to 356 registered students. The original faculty consisted of seven full and eighteen part-time instructors. Although the weather on that day was a pleasant seventy-five degrees, Mason’s new director, Dr. Robert Reid, could not help but point out to the Fairfax Times that Mason was the only college in the Washington area that was fully air conditioned. Perhaps the most sorely missed amenities were food service and a lounge for the students and faculty. During the first week vending machines were hastily set up in a study hall. Mason would later set up an actual dining hall, the Ordinary, in the South Building. It would remain there until the University Union (now known as Student Union I) was built in 1974. 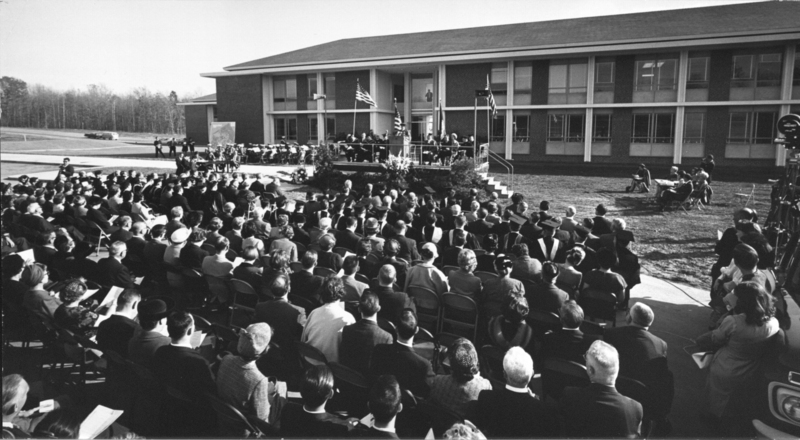 The Fairfax campus was formally dedicated on November 12, 1964. The hour-long ceremony, presided over by Virginia Senator Charles Fenwick, took place directly in front of the North Building. The United States Marine Band, under the direction of Master Sergeant Jack Kline, performed the music for the Academic Procession, the National Anthem, and the Recessional. Among the nearly one thousand attendees were the daughters of Wilson N. Farr; U.S. District Court Judge, Albert V. Bryan, Sr.; Interior Secretary, Stuart Udall; members of University of Virginia faculty; and presidents from area universities and colleges.